4th floor studio apartment with balcony, with incredible sea views, comfortably sleeps 3. Fully equipped with air-con and 24 hour security. Great onsite facilities with 3 restaurants, bowling alley, spa centre, gym and 3 outdoor swimming pools and one indoor. The beautiful sandy beach is literally across the road from the complex with a great selection of water sports available. A free bus outside the complex will bring you to an Aqua-park which is a must for all holiday goers. While you can enjoy the relaxing quiet atmosphere of the complex there are plenty of night clubs within a ten minute bus radius. 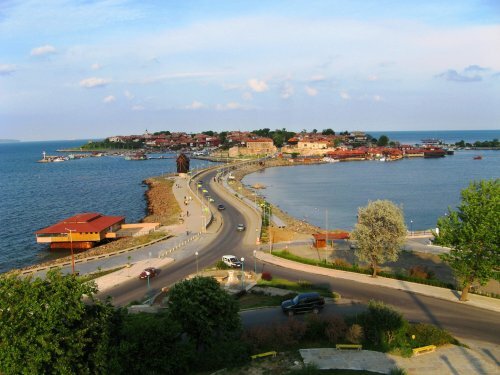 Nessebar is one of the most ancient towns in Europe and included in UNESCO's list of world cultural heritage. Nessebar is well known with its exotic monuments dating from the Middle Ages and the Bulgarian Revival period. The town is situated on a small rocky peninsula in the North part of the Bourgas bay. The white sandy beach is literally across the road from the apartment with a great selection of water sports available. A free bus outside the complex will bring you to an Aqua-park which is a must. While you can enjoy the relaxing quiet atmosphere of the complex there are plenty of night clubs within a ten minute bus radius. We're looking for an apartment or house somewhere sunny in Europe for two weeks preferably in the summer. A bit of night-life with a bit local culture thrown in please.